Construction projects can easily get out of control, so you need to keep the costs in line in order to keep it in budget. You have countless decisions to make and supplies to pick up, but working with a trusted flooring company will help you keep at least one part of your large project on track. Here are five exquisite marble floors that are perfect for that new hotel or a school. This natural stone has a classic look that’s sure to please most of your clients. It’s beige, cream, and ivory tones are well suited to a range of commercial settings from assisted living communities to retail stores. It will brighten up spaces and make them feel more welcoming. One of the great features of Crema Bella is that it adds movement and visual appeal without becoming overwhelming. The background shade is typically the lightest, and darker, monochromatic tones move across the tiles. It will blend into the room while still adding personality to any room. Property owners love how durable this stone is. A polished stone will have sealed pores that make it well suited to wet areas, outdoor applications, and high-traffic zones. Using the durable flooring will help them boost the value of the finished building while saving money on maintenance and repairs in the future. Contractors routinely choose this stone because the neutral finish can go in any room, it works with modern and traditional designs, and it’s very affordable. At Nalboor Tiles, you’ll find wholesale pricing that make it easy on your budget. White and gray merge seamlessly with this traditional marble that never grows old. Blending beautifully in classrooms and courtrooms alike, this stone features a white to light gray background shot through with dark gray and silver veins. It stands out more than Crema Bella, and yet it’s still a neutral choice that can remain in place for decades. Businesses that see a good deal of traffic tend to lean towards Bianco White Carrara because it looks great without showing the dirt too much. The veining helps hide a certain amount of dirt and dust so that cleaning crews won’t have to spend their days just polishing the floor. Sweeping and mopping them on a regular basis will keep them looking great. As a contractor, you’ll love the attractive pricing on this beautiful natural stone. We offer wholesale and bulk rates, so you can save more by purchasing larger quantities. When working on a large commercial project, consider going with this flooring throughout most of the common areas to reduce your overall cost while still making a great impression on your clients. People often focus on the white marbles, but darker tones are also appropriate for commercial projects. When building high-end condos, consider going with Adalia Cappuccino to warm up the space and make it feel more welcoming. This stone has shades of brown, cream, and dark yellow sprinkled across it. The warm tones blend well with other colors, and it can make a very large area feel more intimate. Ideal for kitchens and bathrooms, it has patterns with plenty of movement. This slightly darker color is also a perfect coordinating shade for lighter floors. Use the tan stone to create a border around a room. Install it along with Crema River marble on stairs using one as the riser and the other for the treads. It makes a warm and beautiful backsplash in kitchens, and showers covered in this stone are truly impressive. Order from a wholesaler so that you can get the high-quality stones you want while still locking in the reasonable rate that you need. This pure white to ivory stone carries a higher price-per-square-foot, but it’s in high demand with property owners. The clean colors and complimentary shades make it a great choice for high-end restaurants and hospitality centers. There is some gold and yellow veining moving through the tiles, but all you’ll see from a distance is the clean white coloring. If you’re working with a property owner who really wants the modern look and feel of Vanilla Oro, then make sure that you work with a reputable wholesaler. By ordering in bulk, we can help you save money and keep the material cost down. We’re able to ship stones directly to your worksite or your storage center, and we use reputable shipping companies to minimize damage. The soft shades of Crema River are commonly seen in restaurants and other businesses where the lighting tends to be a little lower. While bright white tiles won’t necessary fit with a fine dining experience, the beige and light mocha shades in this tile work nicely with the more casual atmosphere. It’s a classic look that’s also ideal for spas, hotels, and even schools. The durable tiles can withstand regular foot traffic, and they’re very easy to care for. One of the more affordable marble options, it will fit in your budget as well as carpet or laminates. However, it will give your project an upscale finish that your clients will love. In addition to using it inside the building, you can also install polished, sealed marble tiles on patio areas and outdoor walkways. Nalboor Tiles is a wholesale company that works with the general public. 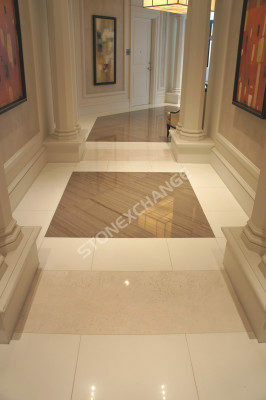 We can provide you with low rates that make our quality marble tile very cost-effective. Our friendly staff is happy to help you place an order, so call us today at 305-501-4548 to discuss your upcoming projects. You can also visit us online to view our different options and see how attractive your next commercial building can be.